Vermont Timber Works handcrafts beautiful Timber Frames for Homes, Barns, and more. [def.] n. Timber Frame is a time-honored building method that uses heavy timber beams and traditional joinery to produce a wooden structure that is durable, beautiful, and sustainable. Vermont Timber Works creates beautiful timber frames with quality, collaboration, experience, craft, and sustainability. Our frames are cut with solar power using today’s technology coupled with yesterday’s time tested traditions. Every Timber Frame we construct is designed in-house and handmade by our experienced craftspeople to the exact specifications of our clients. Bring us your ideas, and we will help you create a beautiful space that will be enjoyed for generations. 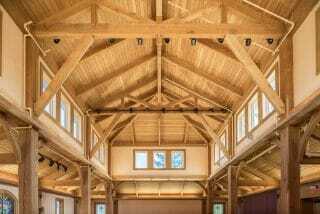 "The beautiful work done by Vermont Timber Works remains evident. Everyone who enters is completely speechless. " "Vermont Timber Works fit quickly and seamlessly within our tight-knit group of designers and builders." "I just want your team, from design on down to assembly crew, to know how much we enjoy our new building and appreciate the great work you did for us." 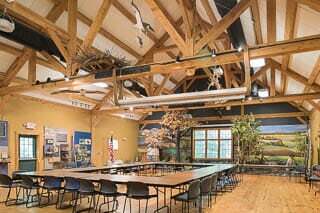 "We approached VTW to build a very unique glulam structural frame. The support throughout the design and fabrication phases was unparalleled. The trusses were delivered assembled which made for a smooth and precision installation. The final product has become the architectural jewel for the new owners business." From engineering and design, to production of your custom built timber frame, our team of experts is glad to help. We work with builders, homeowners, and architects to design high-quality, custom timber frame homes. The Timber Frame Home’s vaulted ceilings, decorative wood beams, sturdy structural timber, and handcrafted trusses, gives a home beauty and character. Our team not only designs, engineers, and constructs timber frames for new homes, we also can add Timber additions to existing homes or use natural wood ceiling beams to dress up living rooms, foyers, great rooms and more. Whether you’re looking to build your dream home or add timber beams to your current home, we will design something that will exceed your expectations. 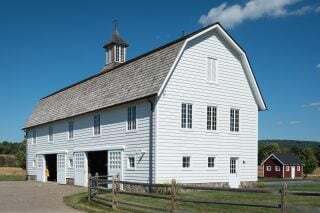 The Barn is an integral part of the timber framing legacy. Post and beam framing is perfect for the spans needed in horse barns and stables. Most barn designs are based on a 10’x12’ or 12’x12’ stall grid with a 10 foot or 12-foot center aisle. We have manufactured rustic timber frames out of native hemlock beams for country barns, and elegant horse stable frames out of smooth finished Douglas fir wood beams. We design barns that have been used for storage, stables, homes, and private events and can help you custom design the perfect barn for your needs. 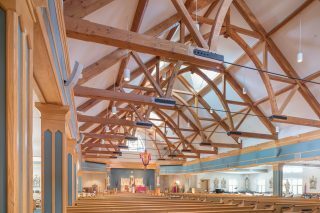 Vermont Timber Works is proud of our experience designing and constructing Timber Frames for sacred spaces. 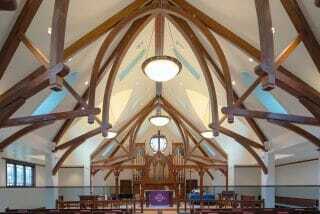 We have worked on many post and beam church and monastery projects over the years. Often, we can value engineer beautiful frames ranging from simple king post truss designs with curved knee braces, to complex scissor truss or hammer beam designs for the most elegant sanctuaries. With our in-house design and engineering experts, we can create a custom timber frame church from the ground up, or we can refinish or add to existing structures. Timber framing is an ideal design aesthetic and building method for spacious, inviting public gathering places at regional, federal and state parks. At Vermont Timber Works, we have designed, engineered and built handsome, durable structures that serve the needs of both local communities and long-distance travelers. Our bold post and beam buildings lend themselves to the scale and expansiveness of parks themselves, echoing the visual strength of forests and the airy, light-filled expansiveness of meadows and lawns. Trusses are a perfect way to dress up a house’s great room or kitchen. They are also economical solutions for hotels, restaurants, and businesses that want a high-end look using timber frame construction. Vermont Timber Works will custom design exposed wood beams or trusses for large or small rooms and make changes and recommendations to meet our clients’ needs. While all our trusses look decorative, most are structural and are designed to carry heavy roof loads. We use traditional mortise and tenon joinery held with hardwood pegs and decorative steel plate connections with heavy bolts. With 30 years of experience designing complex residential and commercial heavy timber projects, our company is an excellent resource for structural engineers looking for timber design solutions. Often we can help find simple solutions for complex design problems and are always happy to help. Many times, joints that appear to require steel gusset plates can be done with traditional timber joinery and hardwood pegs, or an architect, builder or owner will prefer metal plate connections, which we are happy to help design. Heavy Timber projects include hotels, welcome centers, restaurants, pool houses, ski lodges, schools, museums, porte cocheres and many more types of buildings.